Frank W. Baker is a graduate of the University of Georgia (ABJ, Journalism). He worked in television news from 1977 to 1986, at stations in South Carolina, Maryland and Florida. In 1987, he joined the Orange County (Orlando, FL) Public School System as an administrator in the areas of Instructional TV/Distance Education. While there, he collaborated with both Time Warner Cable and The Orlando Sentinel’s Newspapers-In-Education (NIE) to bring media literacy education to teachers and students in the nation’s 16th largest school district. (See 1995 article from Orlando Sentinel; 1996 article from Cable In The Classroom magazine.) Upon returning to South Carolina in 1997, he co-taught a college level media literacy course for educators and developed The Media Literacy Clearinghouse, a nationally recognized media literacy resource website. In 1999, he chaired the National Media Literacy Conference (St. Paul MN). That same year, his content analysis of all 50 state’s teaching standards revealed that almost all state’s standards included “elements of media literacy.” He is past president of (NAMLE) the National Association for Media Literacy Education (formerly The Alliance For A Media Literate America) and past vice-president of the National Telemedia Council (NTC). He is a frequent presenter at schools, districts and conferences across the United States. He has presented at the national conferences of Staff Development For Educators (SDE), the International Reading Association (IRA), The National Middle Schools Assn. (NMSA), and the National Council of Teachers of English (NCTE). Frank worked in K-12 School Services for the South Carolina Educational Television (PBS network) from February 1998- June 2003. 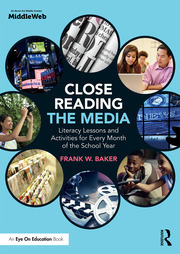 In June 2007, Frank’s work in media literacy education was recognized by the National PTA and the National Cable TV Assn. with the national “Leaders In Learning” award. He has written teaching standards and supporting documents (English Language Arts; Visual & Performing Arts) for the SC State Department of Education. He has been published in Learning & Leading With Technology (ISTE), Education Week, Cable in The Classroom, Telemedium (aka The Journal of Media Literacy), Florida English Journal, Ohio Media Spectrum, Middle Ground: The Magazine of Middle Level Education, Library Media Connection (LMC) and Screen Education (Australia). He served on the National Council of Teachers of English (NCTE) “Commission on Media” from 2005-2008. For several years he helped plan the NCTE Annual Film Screening series at the organization’s annual conference. He tweets @fbaker. He has hosted and participated in webinars for NCTE, ASCD (formerly the Association for Supervision and Curriculum Development), School Library Journal, and the International Society of Technology in Education (ISTE). His first book, “Coming Distractions: Questioning Movies,” was published by Capstone Press (2007). He contributed a lesson plan to: “Lesson Plans for Creating Media-Rich Classrooms” (NCTE 2007). His second book, “Political Campaigns & Political Advertising: A Media Literacy Guide” was published by Greenwood Press (2009). He authored a chapter on media literacy in the ASCD text “Curriculum 21: Essential Education for A Changing World” (2010). His third book, “Media Literacy In The K-12 Classroom” was published by ISTE (2012). He has also contributed chapters to “Mastering Media Literacy” (Solution Tree Press, 2014). In the fall of 2016, a revised (2nd) edition of “Media Literacy in the K-12 Classroom” was published by ISTE. In the fall of 2017, his fourth book “Close Reading The Media,” will be published by Routledge in a collaboration with MiddleWeb. In the Winter of 2009, he traveled to Singapore to consult with the Ministry of Education on incorporating media literacy in the schools and has reviewed their media literacy curriculum materials. He has been a featured presenter at the South Carolina Educational TV (SC-ETV) summer video production institute. In October 2013, he keynoted the Michigan Council of Teachers of English annual conference in East Lansing, Michigan. In November 2013, he received the Jessie McCanse Award (for excellence in media literacy education) from the National Telemedia Council, during that organization’s celebration of its 60 year anniversary held at the University of Wisconsin-Madison. He is a consultant to the Writing Improvement Network, and The News Literacy Project, and serves on the board of the Palmetto State Arts Educators organization (formerly the SC Alliance for Arts Education). In March 2014, he worked with teachers and students at the American School of Bombay (India) and delivered a media literacy lecture at one university and gave the keynote address at an international media literacy conference. Frank is proud of his most recent work with The Academy of Motion Picture Arts & Sciences (AMPAS) in Los Angeles conducting film/media literacy workshops with LAUSD area teachers and students. In May 2016, he helped craft the new Position Statement on Media Literacy for the National Council for the Social Studies (NCSS). In September 2017, he was recognized by the SC Council for the Social Studies with a Lifetime Achievement Award for service to South Carolina educators. As an avid nature photographer, his nature and bird photographs have been published in the Charleston Post and Courier newspaper; the book “Wild South Carolina” (Hub City Press); on the Instagram site of the Audubon Society of SC (May 2016), in The Columbia Star newspaper, the Gills Creek Watershed Association’s 2016 calendar and the Spring 2016 issue of Naturally Kiawah, published by the Kiawah Nature Conservancy. Currently, he is an educational consultant.